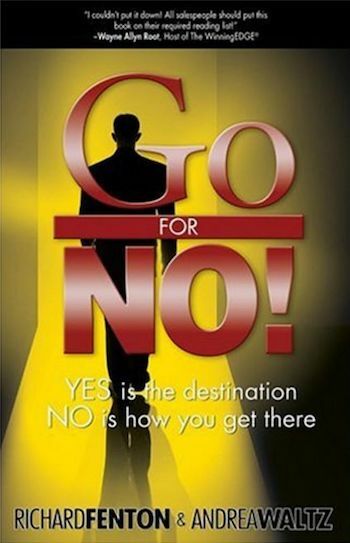 Go For No might just be my least favorite book on the topic of sales that I have ever read. Not because the advice is bad, but because it reads a little like cult propaganda. How it got more than a thousand 4 and 5 star reviews on Amazon I’ll never know. Lets look at what’s good first. First, the book is written in an innovative way considering the topic. The lessons, or “lesson”, I should say, is delivered through a time travel / alternate universe / dreamscape narrative in which our protagonist comes to meet a version of himself in the future, who basically explains what he needs to do to… meet his sales quota. I know, dramatic. Nevertheless, it’s the first time I’ve read a fictionalized professional self-help book like this. Second, the lesson itself—and yes, there really is just one—is good. The whole book could really be summed up into a single statistical sentence: “If you ask everyone, many will say no, but some will say yes.” For anyone trying to get something off the ground, or be an effective (and seriously obnoxious) salesperson, you’ve got to be comfortable hearing “no”. You’re going to hear it a lot, but if you just keep churning through the No’s, you’ll eventually come across a Yes. If you work to hear “no” more often, you’ll also end up hearing “yes” more often. The concept is similar to the commonly discussed abstract, “failing faster”. The idea is to learn and improve, and failure is the necessary stepping stone toward that, and in fact, if you’re willing to fail enough times, you’ll eventually succeed. Save for the nuance, these concepts are generally true. The thing is, what might be considered true at first blush can be turned completely on its head in an exploration of the nuance. And that’s where this book starts to feel like cult propaganda. The narrative oversimplifies, and heavily implies that success is just a matter of acting like a door-to-door salesperson; quantity over quality. So, lets talk about what I disliked so much about this book. First, it’s not a very good story. The characters are shallow, motives one-dimensional, dialogue forced, and the context unbelievable. For example, only a few other characters in the book exist besides the protagonist. Those that do exist are just there to deliver explanations of the principle, in glowing words for the author. When the protagonist meets himself in the future, neither seem especially surprised—within hours they’re actually golfing together. Future is showing the past how good it is to be rich. Which is totally what I’d do if I time traveled all of a sudden. Right. Second, human beings are not one dimensional. It’s outdated wisdom that suggests a person finds the most fulfillment and happiness by attaining wealth. Yet, that’s what the book is espousing. The narrative begins with our protagonist working hard and taking a kind of mental-health break, which, through his travels, he comes to learn he should do. He should be out hearing “no” more and more if he wants to be successful. Who’s definition of success is this anyway? I’m guessing mostly very unhappy people. Third, this book doesn’t need to exist. The concept isn’t by any stretch a lofty or complicated one. A few paragraphs could probably completely suffice to teach this lesson. But instead, the authors opted to publish a book. A book which is neither a good fiction book, nor a necessary non-fiction one. It’s this that makes it seem so cult-like. Why use 30,000 words when a bulleted list would do? Why cram things into a contrived narrative? It’s because this book is, or was, little more than the first step in the author’s sales funnel. The lack of nuance, the glowing dialogue about the author, the almost strategic omission of any actual cost/benefit discussion, is intended to narrow your thinking and come to believe the author has all the answers to all your problems. He doesn’t, the book doesn’t, the method doesn’t. It’s, at best, an important concept to understand among many other important concepts. The book is easy to read. Chapters are short, just two or three pages each, making the whole thing feel like a glorified pamphlet. There’s no index, and no need for one. Honestly, I wouldn’t waste your time. But know this, if you’ve read this post, you’ve probably already gotten more out of this book than you would by actually reading it.